England sit out the next wave of UEFA Nations League and turn their attentions to a friendly against Switzerland on Tuesday night. Fancy the Three Lions to find the back of the net? Get a 25/1 price boost on England to score a goal with Ladbrokes! England were brought crashing back down to earth on Saturday evening as they hosted Spain in their first UEFA Nations League match and are expected to bounce back here. Don't miss the chance to make a £25 profit by staking just £1 on England to score vs Switzerland! Ladbrokes offer 25/1 England to score vs Switzerland + £5 free bet! Open a new account with Ladbrokes before the kick-off (7.45pm UK Time) and claim 25/1 England to score in a much anticipated International Friendly match against Switzerland - An insane offer!! 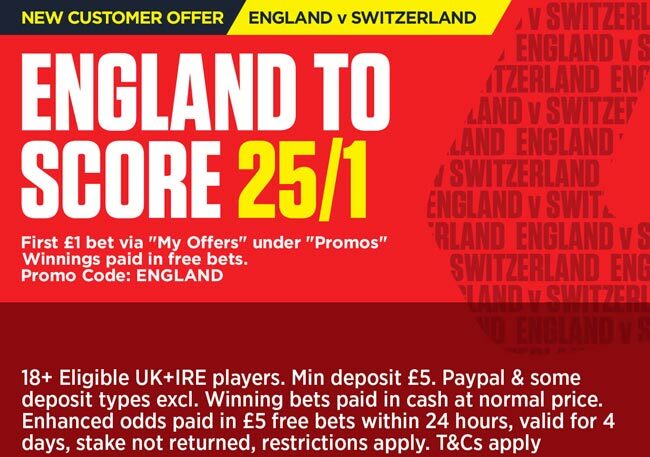 Coral offer 28/1 England to win vs Switzerland in 90 mins + £5 free bet! Having won six and lost none of the last nine games against this opposition, England are odds on favourite to win the game and, of course, to score. England twice beat Switzerland in qualification for Euro 2016, both games taking place in September (2-0 away in 2014 and 2-0 at home in 2015). England have scored 18 goals in their 12 home matches under the tutelage of Gareth Southgate. The "England to score" bet is normally available at 1/5, unless you claim this huge price boost via this page! Ladbrokes are offering all new customers a huge promotion of 25/1 England to score vs Switzerland, click here to get your crazy price in less than two minutes! The promotion is valid until 7.45pm 11/9/2018 UK Time. Max bet €/£1. If England score a goal during the match your first bet on England to score will be paid at 25/1. If England fail to score, Ladbrokes will credit your account with a £/€5 free bet. Payment restrictions apply. E-wallets payment through Moneybookers, Paypal, Paysafe, Neteller or Skrill deposits are not eligible. All credit or debit cards are accepted. "Ladbrokes offer 25/1 England to score a goal vs Switzerland on Tuesday!"